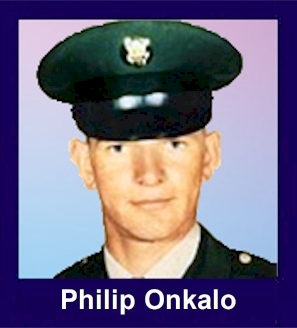 The 35th Infantry Regiment Association salutes our fallen brother, PFC Philip Gordon Onkalo, who died in the service of his country on August 5th, 1967 in Quang Ngai Province, Vietnam. The cause of death was listed as Booby-Trapped Grenade. At the time of his death Philip was 19 years of age. He was from Baltic, Michigan. Philip is honored on the Vietnam Veterans Memorial at Panel 24E, Line 81. The decorations earned by PFC Philip Gordon Onkalo include: the Combat Infantryman Badge, the Bronze Star with V, the Purple Heart, the National Defense Service Medal, the Vietnam Service Medal, the Vietnam Campaign Medal and the Vietnam Cross of Gallantry with Palm Unit Citation. Philip is buried in the South Range (Mt. View) Cemetery in South Range, MI. South Range is located in the Upper Peninsula in northwest MI. just outside of Houghton, MI. Take Rt 41 west out of Marquette, MI and go to Houghton. Turn left (southwest) on Rt 26 and go 5 miles to South Range. It is a very small town and anyone there should be able to direct you to the cemetery. For heroism in connection with military operations against an armed hostile force in the Republic of Vietnam. On 5 August 1967 Private First Class Onkalo distinguished himself while serving as a Rifleman in Company A, First Battalion, 35th Infantry; on a search and destroy operation near Duc Pho. As he was about to follow the point man through an opening in a hedgerow, Private First Class Onkalo saw that the man had unknowingly stepped on a trip wire connected to an improvised enemy explosive. He recognized that the device was detonated by a time delay mechanism and that he therefore had an opportunity to take cover. Determining instead to keep his fellow soldiers from harm despite the grave danger, Private First Class Onkalo yelled a warning of the imminent explosion to those in the rear and then ran forward through the hedgerow and pushed the lead man to the ground; thrusting him out of the way just as the explosion occurred. He received severe wounds to which he later succumbed, but by his valiant and unselfish action he had saved at least one mans life and kept others from serious injury. Private First Class Onkalos heroism at the cost of his life is in keeping with the highest traditions of the military service and reflects great credit on himself, his unit, and the United States Army.